Teen Moms, I want you to know you are not alone! Read my interview with Christian Book Previews about Teen Mom: You’re Strong Than You Think to learn more. 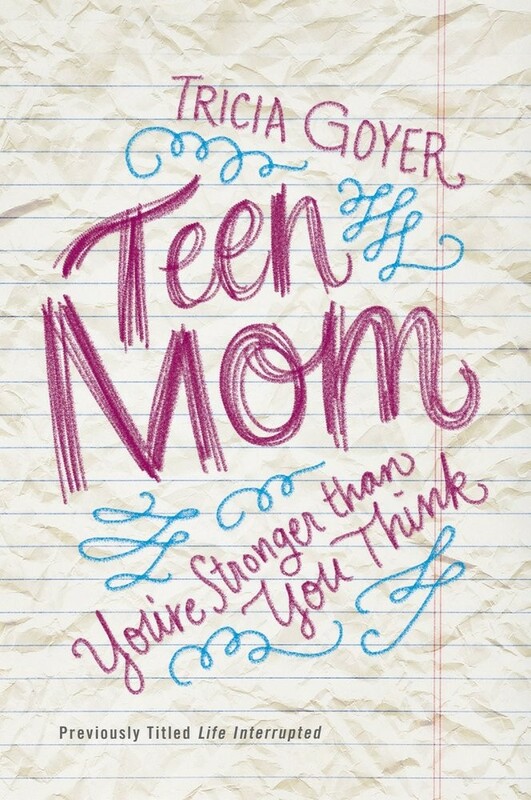 CBP: Teen Mom is a book for teen moms, written by a former teen mom. You also interviewed young moms all over the country. Why was capturing the heart of young mothers important for you? Why did you want to write a book just for them? As a former teen mom, I remember what it was like not to “fit in.” At seventeen I still felt like a kid, but I had a child to raise. It seems that no matter where I went, I always felt like the odd man out. At Lamaze class everyone was with a spouse, and I was with my mom. Parenting books had ideas like, “Have your husband watch the baby while you take a long bath.” That wasn’t an option for me, and it’s also not an option for the young moms I work now with. I wanted to write a book just for them. I wanted to give them a voice concerning their unique struggles, such as dealing with creepy boyfriends and trying to juggle work and school. I also wanted to show them that they’re important and they matter—even if they don’t fit the mold of what society expects a “new mom” to be. 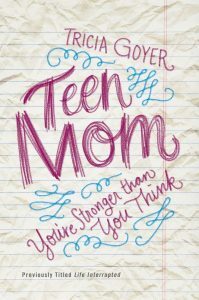 CBP: In this book you share your experience as a teen mother, what were some of the hardest things you faced as a young mother? I’d say the hardest thing to deal with were my feelings of shame. There are many sins out there, but pregnancy out of wedlock is one that sticks out in front of you, literally. You can’t hide it. I remember the looks of other students in school. The looks of people in the grocery store. It made me want to escape into my bedroom and remain there for nine months! Another difficult thing was the lack of confidence in society. I’d get rude comments from old ladies in the grocery store saying that I wasn’t doing something right. One lady made a rude comment about my son having a pacifier! Also, I felt I wasn’t “heard” by professionals such as my son’s doctor. I took Cory in because he wasn’t feeling well, and the doctor dismissed it as colic. They didn’t trust my word that something wasn’t right. It turned out that my son had spinal meningitis, and it was only because of my insistence for them to take a closer look that he didn’t die. It’s hard enough being a good mom, but I always felt on display—like I had to prove myself. CBP: When did you get involved in working with young moms in your community? In 1999, I help launch a Crisis Pregnancy Center in my hometown of Kalispell, Montana. Right away we realized that we needed to do more that just provide free pregnancy tests and counseling—choosing to carry one’s child is just the beginning. I wanted to help moms be the best they could be. So four years ago I help launch a Teen MOPS program. 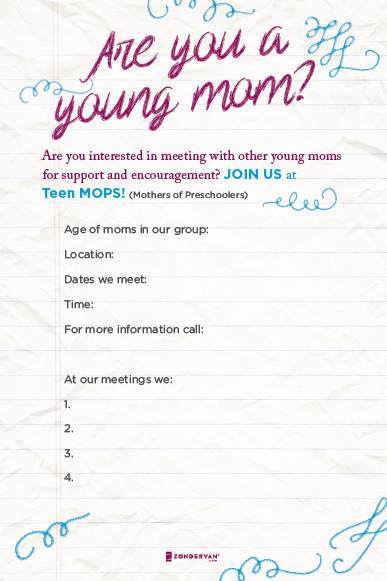 Teen MOPS is part of the bigger organization MOPS (Mothers of Preschoolers) International. Our first meeting we started with two pregnant moms. The next week we had four. After that there were eight. Then the program really exploded. It’s great because most of those from the first meetings are still attending . . . and now they have toddlers. It’s great to see the growing and learning taking place, not only with the kids, but also with the moms. CBP: What changes have you seen in the young moms you work with? The first thing we often see is a softening of their attitudes. Some girls are scary when the first come in. They’ve been hurt and they have a wall around their heart a mile high. They hardly talk and don’t want to participate . . . yet they come, and this tells me that we have something they’re looking for. Once the attitudes change, it seems the heart isn’t far behind. Each meeting one of the leaders shares part of her personal testimony, but the main “evangelism” we do is just loving them like Jesus would, and showing how our lifestyle is different because of Him. We’ve seen girls start attending church and Bible Studies with the leaders. Some have given their hearts to Christ. It’s amazing what short personal stories and a little love can do. Of course, there is also the personal growth of the moms. We’ve seen them finish high school, get jobs, find their own apartments, and interact with their kids on a better level. It’s like being eyewitness to the world opening up before them. CBP: Your book is endorsed by MOPS (Mothers of Preschoolers) International. How else are you working with MOPS to reach young mothers? In addition to coordinating a Teen MOPS group in our town, I also help encourage the growth of other groups in my area and around the nation. I’m always available to talk to those who are interested in starting a new group. Also, I often speak at MOPS’ International Convention. Then there is Teen Mom, of course. I want to do everything I can to get this book into the hands of girls who need it—whether they’re part of a support group or not. It’s not that it’s “my book.” What I really want is for young moms to find hope for their future. CBP: Teen Mom is all about the unique needs of a young mother, can you share some of their greatest needs? Some of these needs include importance, growth, perspective, intimacy and hope. Importance to know that no matter what society says, they can be great moms and a wonderful influence on their child. Growth is needed so that a mom doesn’t feel like she’s “stuck” because of this child. She needs to know that she can grow into the woman she’s always longed to be. Perspective because too often a teen mom only sees obstacles ahead. She needs to see that the future can be bright. True intimacy is a big need, because most girls get pregnancy because they’re seeking this closeness with another person. They need to know that true intimacy is sharing your heart with another, including friends and family members. And finally, what young moms need most is hope. Hope that is found in Jesus Christ. I could come up with 1,001 ways for these young women to become good moms, but the best thing I can do is point them to faith in Jesus. CBP: There is a lot of talk about the problem of teenage motherhood in our country; just how many young mothers are there? According to teenpregnancy.org, there are 800,000 new teen mothers every year. That’s a lot of young women who need to know that they matter, that they can be good moms! CBP: If you could choose one truth that the young moms come away with after reading this book, what would it be? It would be the truth that Jesus is the answer. He is the Prince Charming they’ve been longing for. He is the peace that they’ve been struggling to find. He is the support and the strength for all the days they don’t feel like they can do this “mommy” thing. He is what they’ve been wanting, what their heart is longing for most. That’s what I want them to know more than anything. Do you know a teen mom? Download and send this postcard to her!